18 gauge type 304 stainless steel shelf with #4 satin finish. Shelf has 1/2" lip on all 4 sides. Front lip is hemmed for safety. 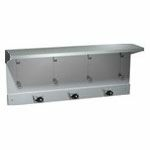 Shelf has 3-1/16" high 16 gauge stainless steel mounting brackets. Structural assembly of shelf and bracket supports shall be of welded construction. Spec sheet available with number of brackets, spacing, etc. Please call. Available 5", 6", or 8" deep and in various lengths. 5" deep 18 gauge type 304 stainless steel shelf with #4 satin finish. 1" (25 mm) hollow pan construction on three (3) sides and 3/4" raised back splash all from one piece. Mounting brackets are 2" high. Number of brackets on 16" to 24" wide shelf is 2; on 30" to 36" wide shelf is 3; on 48" to 60" wide shelf is 4. 6" deep 18 gauge type 304 stainless steel shelf with #4 satin finish with a 3/8" depression. Shelf has a 5/8" lip on front with an extra return for rigidity and safety. Sides of shelf are closed and tapered from front to rear. Rear of shelf has a turned down leg with mounting holes. Fabricated of 20 gauge Satin Stainless Steel. All purpose valve for both liquid and lotion soaps. Size-17" x 3 1/2" x 5"
5" deep x 18" long 18 gauge type 304 stainless steel shelf with 5/8" hemmed lip on front edge. Holds two standard size toilet paper rolls. Overall size: 18" x 4-13/16" x 5"
8" deep #304 satin finish stainless steel shelf with 3/4" return for rigidity. Mop or broom holders are riveted to strip, and rubber cam is ribbed for grasping. Rod and hooks for rags included. 8" deep shelf manufactured from 18 gauge type 304 stainless steel with #4 satin finish with 3/4" return for rigidity. Mop holders are riveted to strip, and rubber cam is ribbed for grasping. Fabricated of 22 gauge, spot welded construction, stainless steel with a satin finish. Wall opening: 16-1/2" x 6-1/2" x 4-1/4"
This mop and broom holder is reinforced with plated steel. It features a serrated cam type hard rubber holder that securely holds your mop or broom in place. Ideal for 1/2" to 1 1/4" diamter broom/mop sticks. It measures overall in size to 2 9/16" wide x 1 5/16" height x 3/16" diameter. It can be installed by itself or used with mop strips and shelving. Place the mop/broom holder on the wall surface and make sure it is level. Transfer mounting points and then drill pilot holes. Secure it in with proper fasteners. 20 gauge type 304 stainless steel with #4 satin finish 4" high back. Top and bottom edges of back return 1/2" to wall. Fitted with 7/8" wide by 9-3/4" high 14 gauge stainless steel hooks. 20 gauge type 304 stainless steel channel. Projects 3-1/2" from the wall. Fitted with spring-loaded, serrated rubber cams. Holds mop and broom handles from 7/8" to 1-1/4".